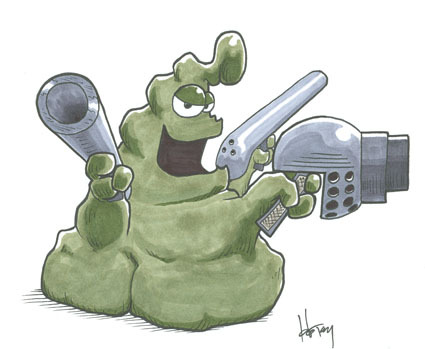 Sergeant Schlock is a carbosilicate amorph, which means he looks like about 250kg (550lb) 2003-05-11 of grey-green putty (or, if you prefer, like the droppings of a very healthy ungulate that can't digest eyeballs). He is extremely strong, reasonably intelligent, and much faster than he looks. His senses are considerably sharper than human, to a point that Lieutenant Sorlie described him as "an alien god of hearing and smell" 2014-04-26 and Doctor Bunnigus just says outright "Assume he can hear everything you're saying" 2015-05-04 . He also has a penchant for violence and could not be happier with his job as a mercenary. Just keep him supplied with enemies, ammo, and Genuine Imitation Ovalkwik, and he will stay happy [too many strips to count]. Or, you know, he could just sit in the bathtub and surf the Infomercial channel on the hypernet. There are few things he likes more than a good bathtub, or one of those epic infomercials like "Getting Your Doctorate in Engineering from Popeil University." has displayed proficiency with many types of firearms, but shows a strong preference for ones whose firing pattern could be described as "suddenly, violently, and all over the place" 2008-08-14. His favored weapons are a plasgun and a pair of sawed-off multicannons. That said, he is just as deadly unarmed; he is effectively invulnerable in physical combat, can easily crush most opponents, and eats enemies alive on a regular basis. It has been said by that the points on Schlock's moral compass are "eat it,kill it, make friends with it, or take a bath in it" 2009-04-25. Schlock's home planet is Ghanj-Rho. He was "born" when two amorphs, his "parents" S'tibron'ganfragdts'chvipl (or "Killer" to keep things simple) and Jane, battled to the death. In normal amorph combat, the winner is the one with the best immune system. The winner retains personality elements of both combatants, and is why such combat often unites warring tribes. Killer was able to purge all traces of his opponent from himself after a fight 2001-12-22, and that is why Jane was ready to sacrifice herself to rid the world of Killer. However, instead of the toxic inert lump of amorph flesh expected of this fight, what was left behind was... Schlock. Eventually it was revealed that "Killer" was a failed hero, trying to save his people from Lady Emily's oppression of the amorphs, and Lady Emily's "daughter" Jane that tried to kill him was duped into it (Summed up most succinctly here: 2002-03-18). The spectators of the fight saw Schlock as an abomination and quickly ganged up to kill him. Schlock fought back and ran way 2001-12-23. Schlock's earliest memories were what soon happened sometime after his "birth". He knew he was being hunted but did not know by whom, and also knew of a group of pirates going off-world. They met and the pirates sold Schlock to a circus. Sometime later, Schlock signed up and became a member of Tagon's Toughs 2000-06-12. Soon after he was promoted to Sergeant. On 2000-06-18 Schlock gives us a clue to the history of his own name: "my name is rich with meaning. Dripping with it, even. "Schlock" means "inferior" or "sloppy". It comes from the Yiddish "Shlak" meaning "wretch" or "nuisance". That word comes from the pre-space-travel german word "slahan" meaning to strike a blow...". Schlock's first appearance was in the first ever comic 2000-06-12, when trying to enlist in Tagon's Toughs. This page was last edited on 31 July 2017, at 23:00.